My church quilt group makes baby quilts for the newborns of members. When the number of ready quilts is low we start a round robin. Each person selects several fabrics from our donated stash. The first person makes a square and passes it on to the next. (The square I made appeared here) I was totally excited about adding to the first but the second just didn't thrill me. Sue started with these 9 fussy cut framed sea creatures. I seamed them together and added the zigzag border. The easy funky zigzag comes from Collaborative Quilting by Moran and Marston. I was given the rail fence center. 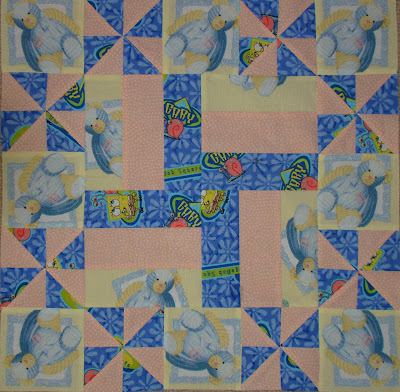 I added the pinwheels and fussy cut teddy bears. Clink on the picture for a close up and try to figure out what turned me off. Maybe its a generational thing. That zig zag border is fun. I could never see what everybody saw in Spongebob. I guess I don't have a sense of humor or something. That's a great idea for the quilts, I'm sure a baby doesn't know about spongebob, lol. 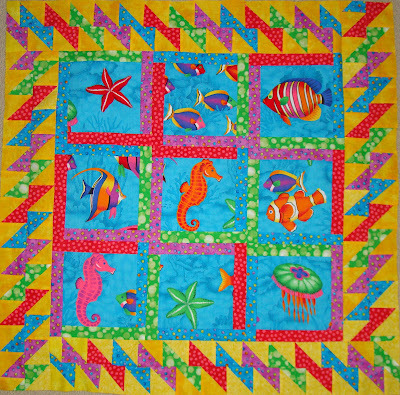 I love the Zig Zag border that was inspired by Collaborative quilting.... a terrific book! Ahh, Spongebob! I'm a Spongebob fan but he does not equate into good quilting fabric, especially with teddy bears. The child will probably love it though. A round robin is a good -- and fun -- idea for baby quilts.